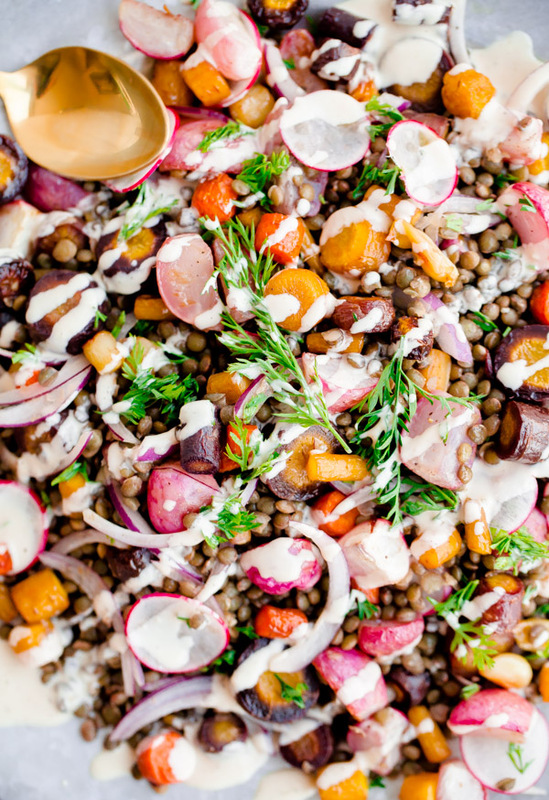 Healthy and hearty lentil salad filled with roasted carrots, radishes, sliced red onion, and tossed with a lemon-tahini dressing. Naturally vegan and gluten-free! 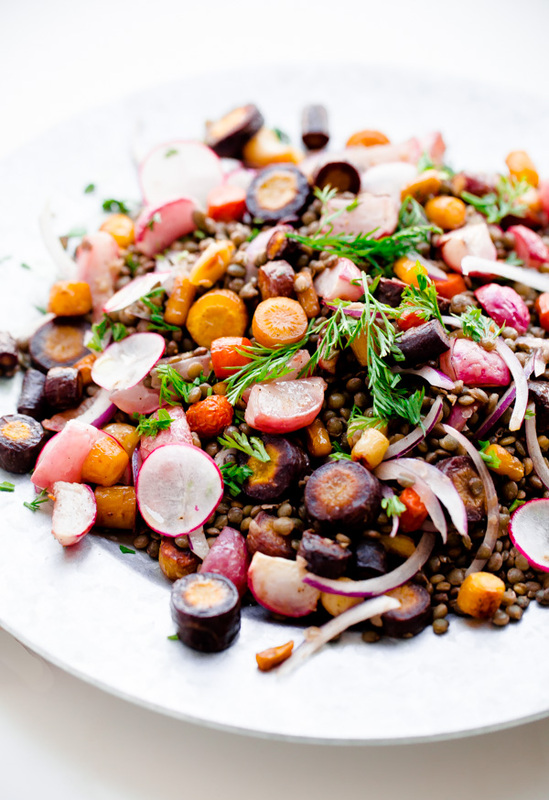 Oh, this roasted carrot lentil salad. The recipe and photographs (all three million of them) have been patiently sitting on my computer for some time. 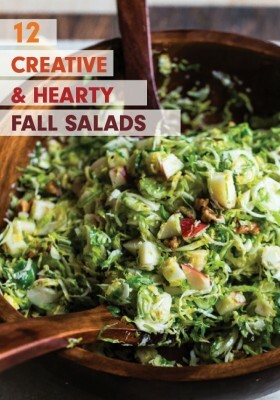 I felt that it was high time that I shared a hearty, super nutritious salad with all of you. Also, my oldest sister recently commented on the fact that I’ve been sharing a lot of waffles lately. Touché. 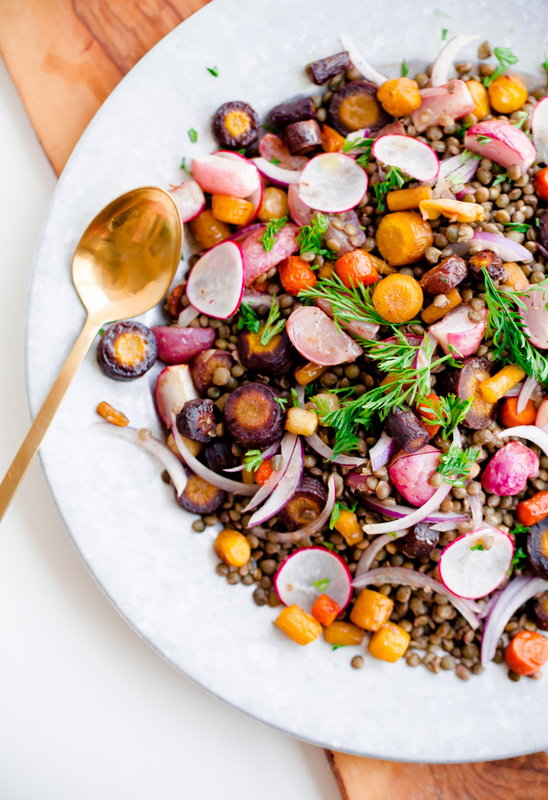 Today’s lentil salad can work as a main course (accompanied with a few slices of hearty, crusty bread), side dish, and makes great leftovers. It can be served at room temperature or cold straight from the fridge. If you’re not serving the salad right away, I recommend thinking ahead, preparing this dish on a Sunday morning or afternoon, and saving it for the rest of the week. There is nothing more satisfying than opening up your fridge at the end of a long work day and realizing that you already have lunch or dinner figured out for the next day…or two! There are so many things happening in this salad that I can’t even figure out where to begin! Let’s start with the roasted rainbow carrots. I mean, really, is there anything prettier? Grab a bunch of super fresh produce, hand me a camera, and I could literally occupy myself for hours. My local grocery store in Chicago, Mariano’s, happens to sell bunches of rainbow carrots at a very affordable price. Similarly to how I feel about fingerling potatoes, when it comes to my carrots, the more colors the merrier. 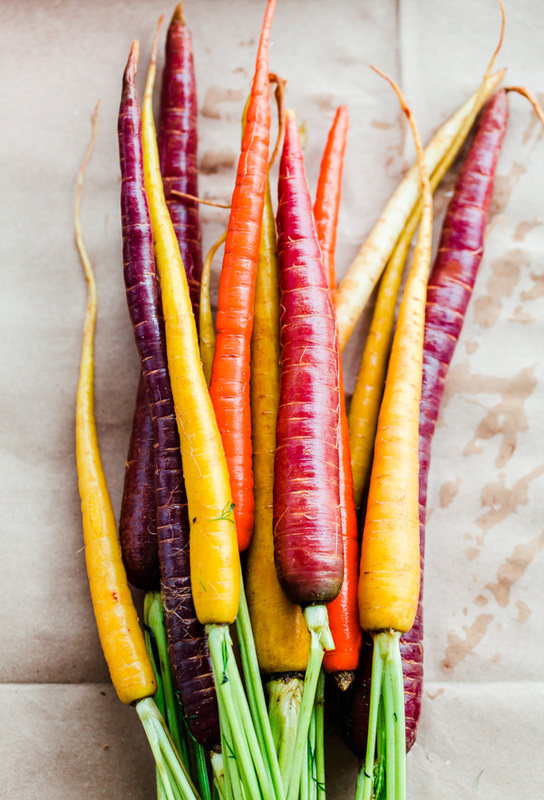 Plus, rainbow carrots actually contain loads of extra nutrients as well. In my mind, it is a win-win situation. Obviously, regular carrots will work just fine for this recipe. 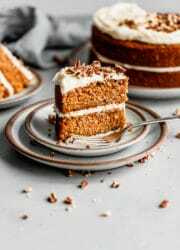 However, I do recommend steering yourself towards the super fresh carrots (preferably ones with green leafy stems still attached) for this recipe, because they are generally fresher and you’ll be using the leafy carrot top stems for garnishing the salad! In addition to the roasted carrots, this salad also contains roasted (and raw) radishes as well! 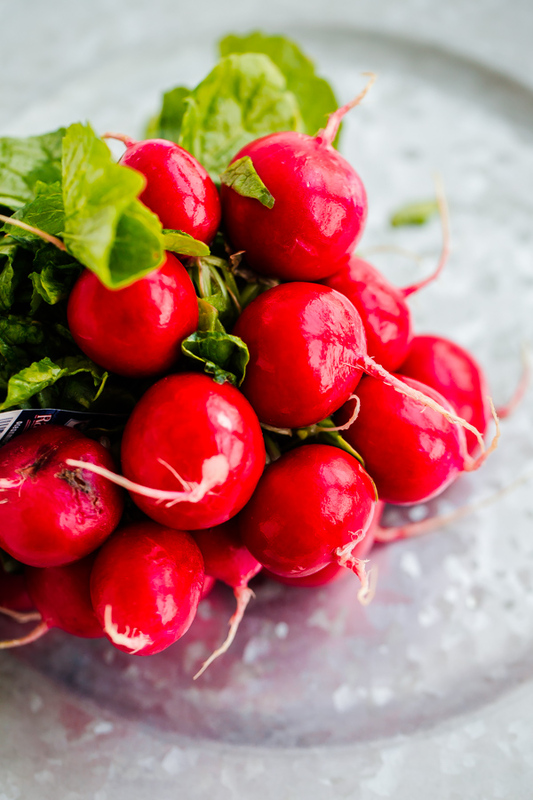 If you’ve ever tasted a raw radish, you know that they can be peppery and a bit spicy! When roasted, radishes are transformed into sweet, juicy bites of caramelized heaven. If you’re not a fan, feel free to leave them out. Truthfully, this salad would taste great with a wide range of roasted vegetables. Get creative and twist it up! The most important part of this salad are the lentils. If you’ve ever found yourself in front of the bulk bin section of the grocery store, you know that dried lentils come in a large variety of shapes, sizes, and colors. It can be overwhelming at times. For this recipe, you’ll want to find French green lentils (referred to as Le Puy lentils). 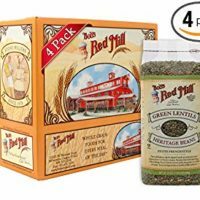 These are my go-to lentils for soups and salads, as they hold their shape extremely well once cooked. Next comes the tahini dressing! 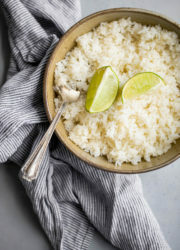 It couldn’t be easier to make and is a simple combination of tahini paste (ground sesame seeds), lemon juice, salt, and pepper, and thinned with warm water. Truthfully, this dressing tastes great on everything. Literally, everything. I could eat it straight from the bowl. It is that addictive. On that note, make a double batch and keep the leftovers in the fridge! 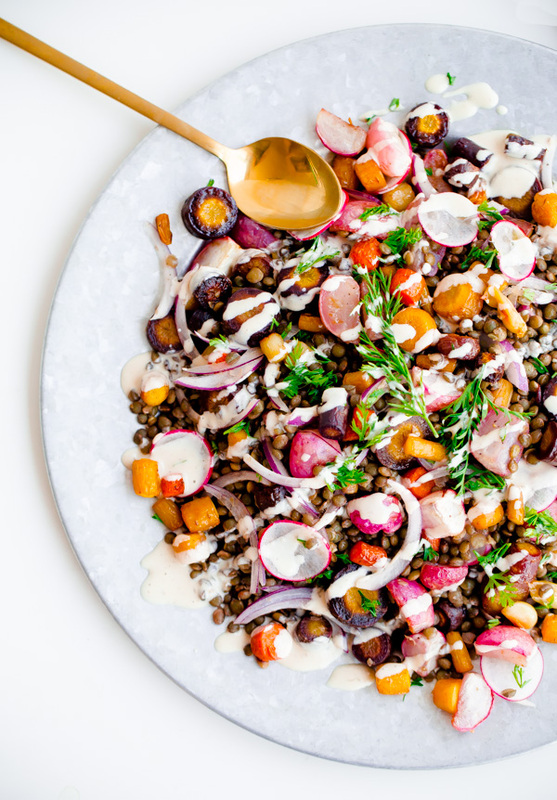 Healthy and hearty roasted vegetable lentil salad filled with roasted carrots, radishes, sliced red onion, and tossed with a lemon-tahini dressing. Naturally vegan and gluten-free! 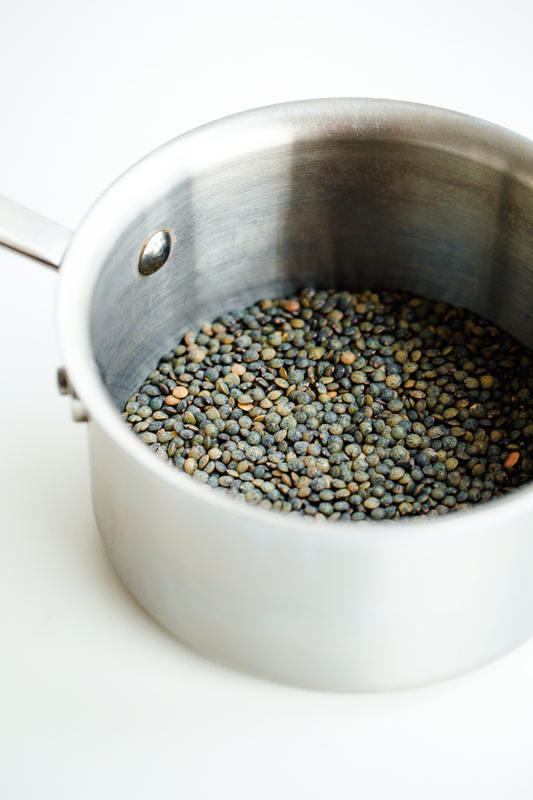 Soak and cook the lentils: Place the dried lentils in a medium saucepan. Cover with cold water and allow the lentils to soak for one hour. Drain the lentils and return to the same saucepan. Add 3 cups of water, the quartered onion, smashed garlic, bay leaf, and 3/4 teaspoon salt. Bring the lentils to a boil, reduce the heat to simmer, and cook the lentils for 25 to 30 minutes, or until tender. Drain in a fine-meshed sieve and discard the onion, garlic, and bay leaf. Place in a large serving bowl to cool. Toss with a tablespoon of olive oil. Roast the vegetables: Meanwhile, preheat the oven to 425 degrees Fahrenheit. 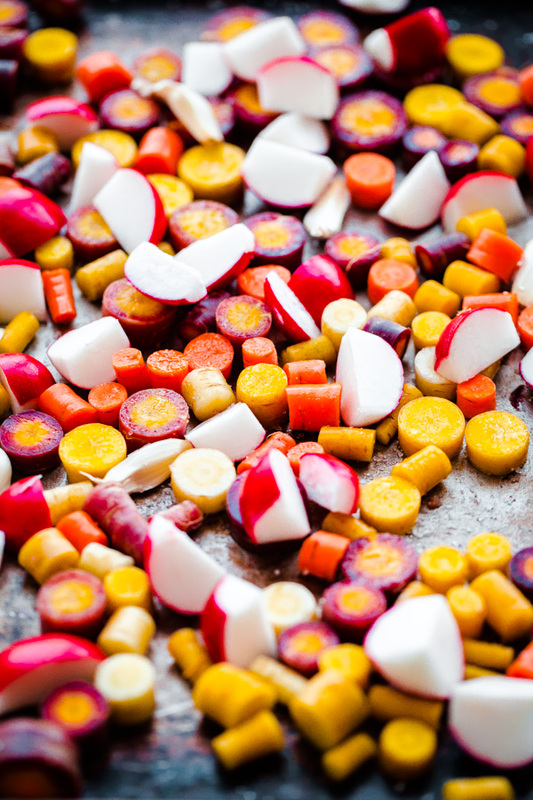 Slice the carrots into 1/2-inch rounds (the skinny ends of the carrots can be left in larger chunks, try to keep the carrots as consistently sized as possible) and cut the radishes into quarters (reserving one radish for garnishing. Place the carrots and radishes on a large sheet pan, along with the garlic cloves (leave the skin on), and toss with the 2 tablespoons of olive oil, 1 teaspoon salt, and 1/4 teaspoon freshly ground black pepper. Roast for 20-30 minutes, tossing the vegetables every 10 minutes or so, or until the carrots and radishes are caramelized and tender. Remove the roasted garlic cloves from their skin (discard the skin, but keep the cloves) and allow the vegetables to cool to room temperature. 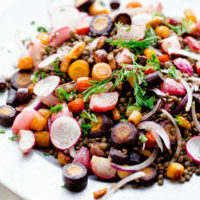 Add the roasted vegetables and garlic to the cooked lentils, along with the sliced red onion, and toss gently to combine. Season to taste with salt and pepper. Prepare the dressing: In a small bowl, whisk together the tahini paste, lemon juice, salt, and pepper. It should be thick. Add 3 to 4 tablespoons of hot water (depending on your brand of tahini paste, you might need more or less to achieve the right consistency) and whisk gently until smooth. The dressing should be the consistency of a thick salad dressing, but should still easily drizzle from a spoon. Using a mandolin, cut the remaining radish into very thin slices. Roughly chop some of the reserved leafy stem tops of the carrots (roughly 1/4 cup or so). Garnish the salad with the sliced radish and chopped carrot stem tops. Drizzle the salad with the tahini dressing and serve at room temperature (this salad makes great leftovers and can be served cold from the fridge). The dressing absolutely brings this entire salad together, so don’t be tempted to skip it! This salad is so fresh and colorful! I love all of the topping you’ve added! I’m seriously just scrolling up and down and staring at these photos. These are INSANELY gorg! And this salad sounds AMAZING. LOVE that tahini dressing here girl – awesome recipe! Pinned! THANK YOU TAYLOR! 🙂 You’re so sweet! Stunning photography! And the recipe is something my family would love. I’m definitely going to try. Thanks! Thanks so much Amy! Hope you like it! This salad is colorful and bursting with nutrition. Exactly what I need after a indulgent week. This is quite possibly the prettiest, more colorful lentil dish I’ve ever seen! 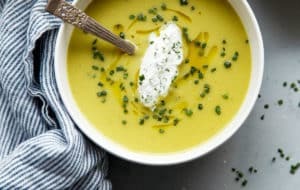 Not to mention it sounds fantastic – lentils, carrots, and tahini are all staples in my household, so hopefully it won’t be long before I give this a try. Thank you so, so much! 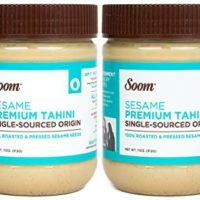 I’m obsessed with tahini. I make this type of dressing constantly and love to drizzle it on everything. Let me know if you end up trying it! Haha! So true. Thanks Katrina! Carrots and lentils are so perfect together. The colors in this salad are amazing. I can understand why you took 3 million photos! They look so great. Seriously! SO.MANY.PHOTOS. I couldn’t choose! Thanks Kathryn! And glad to hear you like the waffles too 😉 I’ll tell my sister that! YES! I love lentils! Whenever I cook with them, I’m always like, “Why the heck don’t I cook these more often?” I should start following my own advice and making a big batch to put in the fridge each week 🙂 Thanks Jessie! I love your blog! You can never have too many waffles, but there’s always room for a gorgeous salad. Love this version! Pinned. Don’t worry! I’m sure I’ll post another waffle recipe soon 😉 Thanks Jennie!!! And thank you for sharing! 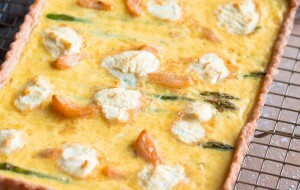 This looks fantastic, and just what Dad and I should be eating after a very rich Scandinavian diet! Yum! I save so many of your recipes to make later. I am definitely saving this one. 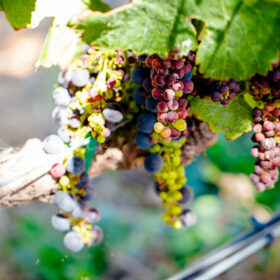 The colors are so vibrant, your photography makes food jump out to say eat me! Thank you SO MUCH Sarah!!!! Really means a lot! i have a huge bag of lentils sitting in my pantry, gotta try this! and that tahini dressing…..mmmmm! Very interesting recipe!! I will try it. Can I use the Tahini dressing with other salads pls? 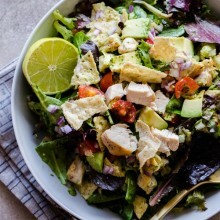 So many people think that colder weather means the end of healthy eats, but this salad is proof that that is NOT TRUE! 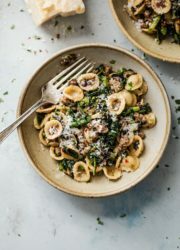 Can’t wait to get my hands on all of these ingredients and get this on my dinner menu! We made a version of this last night and it was fantastic! I stupidly forgot about the red onion so was missing the crunch factor, but that was my fault… next time we’ll remember. That dressing is absolutely delicious. Can’t wait to make this again! I made this for dinner tonight and added beets and sweet potatoes. It was delicious! I will definitely make again. Now I’m off to bake chocolate chunk oatmeal bread with the calories I saved on dinner. Thanks for the great recipe!! Wow! I absolutely love your photography! What do you shoot with? And do you use all natural light? 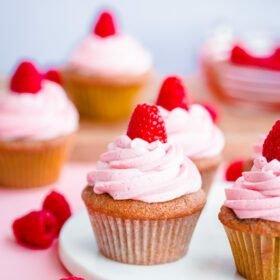 This looks of old, I want to eat it now! But, I’ve only just finished breakfast! Your site is great but would be so much easier to navigate without all of the adds popping up and getting in the way! Hi Kristin! I’m really bummed to read this, but understand and appreciate you sharing your thoughts. It’s always a fine line between having ads (which help support the running of this site and what I do for a living) and reader experience. It’s something I really struggle with – and am always re-evaluating. Thanks for sharing and I really hope you come back! I made this tonight. I ate as a salad and added a few chopped walnuts. I added steak for my husband and kids as they are not vegans. It was a hit! Sooooo very hearty and complex flavors. Excellent!!! Love that idea! I haven’t added meat to it, but I imagine so many different things would work: beef, chicken, lamb, etc. Thanks so much for the feedback Cj! Hey Erin! Great question. It could definitely work in a pinch, but I don’t really recommend it for best results. 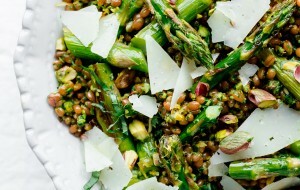 I use French green lentils in this salad, which hold their shape very well once cooked. Canned lentils are a different variety, and tend to be fairly mushy in my experience (best used for a quick soup or something) – so they wouldn’t hold up quite as well in this application. Hope this helps! Hey, Laura! I LOVE your work! 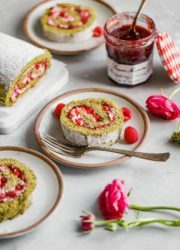 I’m wondering if I can use one of these photos on my website (the one below: “On that note, make a double batch and keep the leftovers in the fridge!”). I’m making a static front page and I would love to include this picture (& I can make sure to link back to your site to ensure that you get credit). I am wondering if you would be open to that! (Also, I totally understand if it isn’t your thing). No pressure 🙂 I just love these photos! This recipe was so delicious. I’m trying to get the men in my house to open up to a “one part plant” diet, so this healthy and hearty salad was a perfect endeavor. My husband actually raved about it. 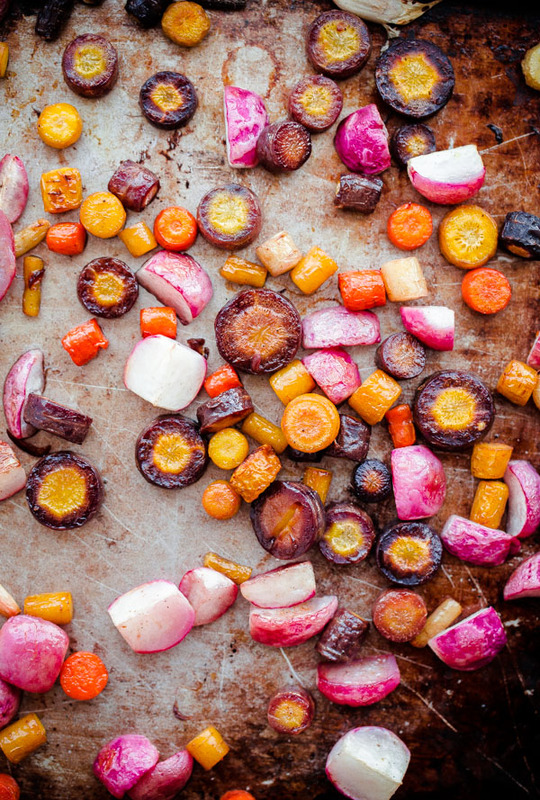 We had never roasted radishes before, so that in itself was life-changing. Thanks for making dinner a hit! So thrilled to hear that! Thank you so much for the feedback Maddison!